Greet your guests with a time attested attractive door knocker. There is a wide variety of styles and materials available to compliment the home's exterior. A proper sized door knocker will add grace to your home. Some internet sources claim that door knockers have fallen out of grace. However, I think the opposite is true. Just go on-line or visit your local hardware store to see what is available. There are basically two styles, one-piece and two-piece knockers. In the one-piece version you have to install only one piece, the knocker and strike plate are all in one. 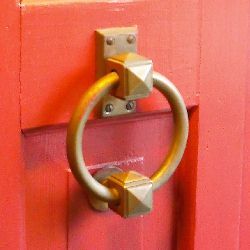 In the two piece version, like the ring style knocker, two pieces, the knocker as well as the striker plate, have to be attached to the door separately. Shown to the left is the popular shield style door knocker finished in polished brass. Some door knockers can be engraved with a name, apartment number, or just say "Welcome" or "God Bless"
TIP. It may be a good idea to purchase the door knocker from the same place that is doing the engraving. This is to ensure that the text you want engraved will fit on the door knocker.